History: For a long time period melissa has been applied for various purposes. The early reports can be pointed out from Roman scriptures. In Arab countries the remedy was used for treating nervous instability and depression, and in England the herb was used for washing the furniture. According to the medeival age writer John Evelyn, balm is a potent medicine for stirring up the mind and fighting depression. Used for: The medicine is applied for relieving spasms, soothing the nervous system, eliminating excessive gas from the bowels, stimulating the stomach, and boosting menstruations. 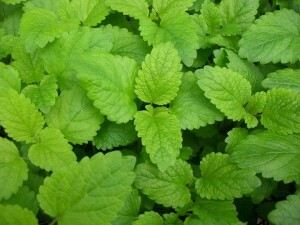 Lemon balm is a popular component added to teas, due to its pleasant smell and mild calmative characteristics. The tea is widely applied to promote sweating, and reduce fevers associated with influenza and cold, menstrual spasms, anxiety, headaches, and insomnia. The leaves serve as an ointment for insect bites and wounds. Some perfumery producers apply melissa as a core component of their products. Balm is applied in different types of nervous conditions. Balm is potent of soothing spasms, treating asthma, bronchial catarrh, colic, gas accumulation in the bowels, and dyspepsia. The herb is successfully applied for toothaches and headaches, especially for giddiness and headaches associated with pregnancy. To induce menses use melissa as a bath supplement. Additional Info: Balm is found at the side of the road, in gardens and fields. It’s a perennial herb which can reach 3 feet in height. Green-colored middle-sized leaves are located oppositely. The plant blossoms from mid-summer to the beginning of autumn. They can be yellow, pale rose or bluish-white. Processed plant has a smell of a lemon. Preparation and Intake: To make tea, take 2 tablespoons of herb for a glass of boiling water. Taken warm. To prepare a cold extract, take 2 tablespoons of the plant for a glass of water (cold), infuse for 8 hours. In form of a powder the dose is approximately 20 grains a time. Safety: In the USA the herb is considered safe on the whole. In the UK the plant is an over-the-counter medicine. In Canada it is non-prescribed as well. In France the herb is referred to as a conventional medicine. In Germany balm is categorized as an over-the-counter medicine.